Kimchi. I think it’s one of those things you either love or hate. If you’re easily offended by strong smells, especially of the fish and garlic variety, you will probably not like kimchi. HOWEVER, if you’re Korean at heart and don’t mind the pungent stench of fermenting cabbage, you’re in the right place. Since leaving Korea 3 years ago, I have indeed found myself missing kimchi. It was such a staple in the country, and I started taking it for granted. 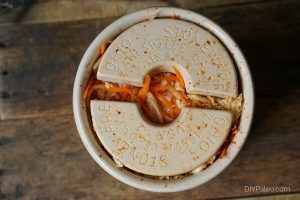 I never ate at a restaurant or in a Korean home without kimchi on the table. I bought it by the pound from giant metal bowls at the outdoor market. The most legitimate kind I’ve found in America was from a gas station in Fort Collins, oddly enough. The shop owner’s Korean wife made it. And it was the perfect balance of sour and spicy, with just enough crunch to the cabbage. Aside from the random gas station, I’ve had trouble finding kimchi without unnecessary ingredients like rice flour, preservatives and a lot of sugar. Some of the jars I’ve gotten from Asian grocery stores have tasted weird or like chemicals. So, after too many disappointments, I took matters into my own hands. 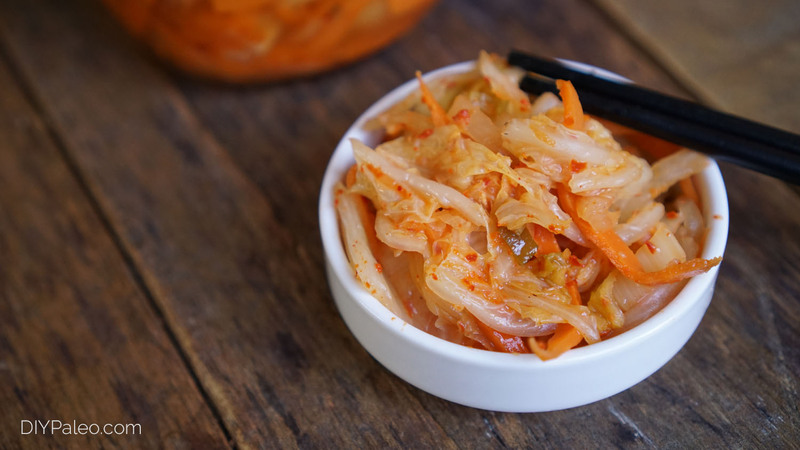 This kimchi uses only a little coconut sugar, just so that the bacteria have something to eat as the cabbage ferments. I don’t recommend using any other pepper besides gochugaru (Korean red pepper flakes, available at Asian markets). The red pepper flakes we have here in America are from a different kind of pepper, and the flavor just won’t be the same. By the way, have you ever tried fried kimchi? DO IT. In Korea, I used to fry kimchi and eat it with eggs for breakfast. Frying probably kills a lot of the good bacteria, but it’s worth it. Uncooked, it still makes a mean side dish/garnish. Cut cabbage into 2-inch pieces and place in a large mixing bowl. Cover cabbage with water and salt. Press down on the cabbage with a plate until water comes over the top. Let sit for 45 minutes. 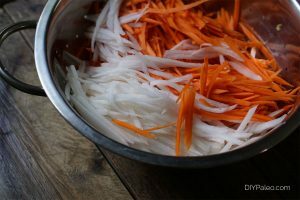 Cut carrots and daikon into matchsticks (a mandoline is helpful here). Set aside. Cut green onions into ¼-in. pieces and set aside. 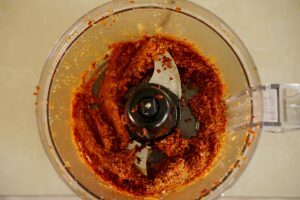 In a food processor, blend the remaining ingredients to form a thick paste. Drain and rinse cabbage, then put it back in the bowl. Add carrots, daikon and green onions. Coat veggies well with the pepper paste, then transfer to a fermentation pot or glass jar. If using a fermentation pot, place the ceramic weights firmly down onto the veggies. Otherwise, press a plate or piece of wood onto the veggies until liquid comes over the top. Then place 2 rocks on the wood or plate. Cover loosely with a lid. 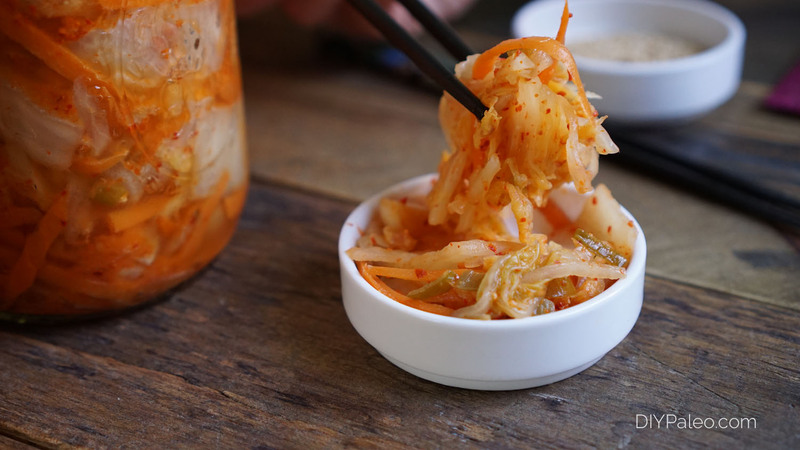 Let kimchi ferment for 5 days to 2 weeks, tasting every few days until it reaches a sourness you like. Keep in mind it will continue to ferment a little after you put in the fridge. Transfer finished kimchi and liquid to glass quart jars with lids. Store in the fridge. Chicken Salad Where do mushrooms fit in?